The Two Strong Hearts Tour is set to commence in Margaret River on Saturday 4th April, 2015 (Easter Saturday) at the stunning Sandalford Estate. 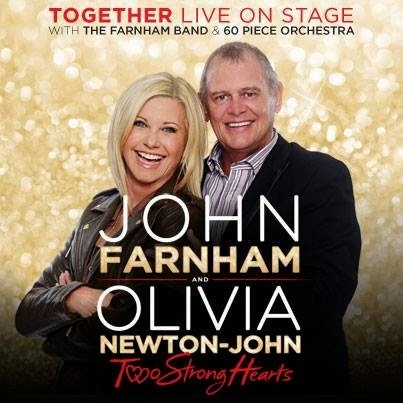 John Farnham and Olivia Newton-John together with the Farnham band, singers and a 60 piece orchestra promises to be a unique, not-to-be-missed concert event. Olivia Newton-John, AO, OBE is a four-time Grammy award winner who has amassed five No. 1 and ten other Top Ten Billboard Hot 100 singles and two No. 1 Billboard 200 solo albums. Eleven of her singles (including two platinum) and 14 of her albums (including two platinum and four double platinum) have been certified gold by the RIAA. Her music has been successful in multiple genres including pop, country, and adult contemporary, and has sold an estimated 100 million records, making her one of the world's best-selling artists of all time. I have seen ARIA Hall of Fame many times. Now I am thinking to visit NY to see NYC events, as I have heard a lot about those events. This time I am going to see classical live show there, as I am great fan of classical music and classical dance.